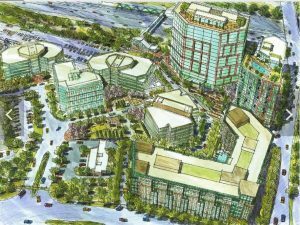 The Fairfax County Board of Supervisors has approved the rezoning of nearly 12 acres of office space near the Wiehle-Reston East Metro Station along with Vornado Realty Trust’s plans for its transformation. The area, adjacent to the Metro station at Wiehle Avenue and Sunrise Valley Drive, will be redeveloped by Vornado into 1.5 million square feet of residences, hotels, restaurants and retail. Washington Business Journal first reported on the approval yesterday. The nearly 12 acres have long been zoned as industrial. With Vornado’s redevelopment plan, three existing six-story office buildings will remain, but the rest will be transformed into a live-work-dine-shop destination for those who want to be close to Metro and Reston’s busy business corridor. The development will include a seven-story building that will fit up to 200 residences, another 24-story building that will fit up to 300 residences, a new 22-story office building of more than 350,000 square feet, and a new 14-story hotel that will feature around 175 rooms, according to Vornado’s application as reported by the county. These new buildings will be among some of the tallest in Reston. Occupants of the new development will have access to both the north and south sides of the Metro station, from Sunrise Valley Drive via Commerce Park Drive. Retail and dining businesses would be on ground floors of the buildings and would aim to minimize car use. The plans also include a total of 1.5 acres of open space, with small parks, bicycle tracks and a promenade along the businesses, and will feature public art including a water feature. 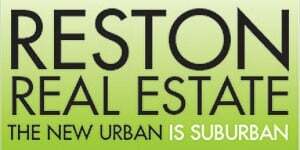 Residents of the development will also be Reston Association members, and therefore would have access to the pools, tennis courts, event and recreation opportunities that come with membership.